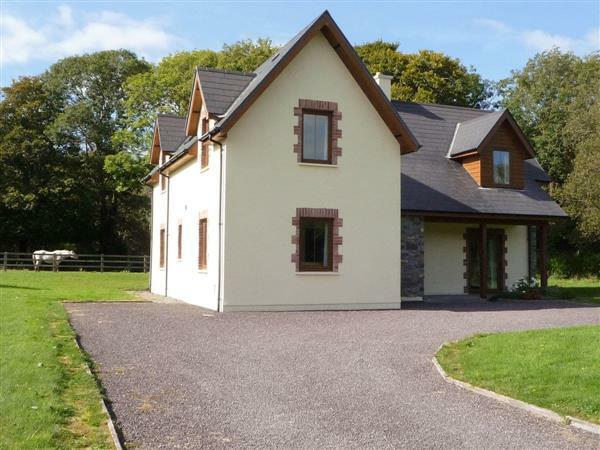 Ardnagashel Woods in Ballylickey, Co Cork sleeps 8 people. Close to the shores of Bantry Bay and within 200 yards of a pebble strand, this detached holiday home is tastefully furnished, has its own patio and lawned area, and shares spacious grounds on the exclusive Ardnagashel Estate. Set between Glengarriff, 4 miles, and Bantry, 6 miles, it is ideal for exploring this beautiful area. Far-famed for its harbour and wooded valley setting, Glengarriff has craft shops, the Garnish Island Gardens, and a nature reserve, also gateway to the Beara Peninsula. Bantry has the music events venue of Bantry House, cinema, leisure centre and golf. Canoeing, kayaking and fishing within a short distance. The Sheeps Head and Mizen Peninsulas offer more spectacular scenery and pretty villages, while Gougane Barra National Park has a lake and mountain environment. A drive over the Caha Mountains brings you to Kenmare. Shop 2.75 miles, pubs and restaurant 3 miles. Ground floor: Living/dining room with French doors/kitchen with tiled floors. Utility room. Double bedroom with en-suite shower room and toilet. First floor: 3 bedrooms: 1 double (5ft) with en-suite shower room and toilet, 2 twin. Bathroom with shower attachment and toilet (also accessed from one of twin bedrooms). Elec storage heaters and electric by meter reading. Bed linen included. Towel hire. Cot and high-chair on request. DVD. Elec hob and oven. Microwave. Washing machine. Tumble dryer. Dish washer. Fridge/Freezer. Lawned and gravelled garden with patio and furniture. Shared grounds. Ample parking. Holidays at Ardnagashel Woods run from Saturday to Saturday. For a better idea of where Ardnagashel Woods is, you can see Ardnagashel Woods on the map below. Do you want to holiday near Ardnagashel Woods (W31565), you can see other cottages within 25 miles of Ardnagashel Woods; have a look to find your perfect holiday location.